So far in this World Cup we’ve been hearing that the heat in Brazil is responsible for a series of massive upsets and for the generally high number of goals scored in the tournament so far. In addition the old mantra of “European teams can’t play in the heat” has been trotted out. I decided to do a very rough analysis on the group games in the tournament to see if I could find any statistical evidence that any of this was true. Firstly I tabulated all the results from the group games and added the relative humidity and temperature from FIFA’s own match reports. For one match (England vs Italy) I couldn’t find a FIFA number for the humidity so I took it from a number of match reports in the press. As well as who won each game and how many goals were scored I also added a column for the number of goals scored after the 70th minute of the game. To try to quantify the conditions in a single number I used the NOAA Heat Index* calculation to estimate how hot it felt to the players. This is a relatively crude instrument and doesn’t include direct solar irradiation but, meh, I don’t have time to do more. I also didn’t attempt to factor in the relative strengths of each side (Mexico beating Croatia was not as big a shock as Costa Rica beating Italy), that is probably worth doing so if you want to do that yourself, go ahead. 2. The matches which were won by European teams were not that much warmer than the ones they lost or drew. Below are the histograms for the games won, lost and drawn by European teams when they face opposition from other continents. Heat index of games played between European teams and those from other continents. So on first inspection it appears that the European teams did better in cooler games. I did a KS test to see if the games European teams won were drawn from the same distribution of conditions as the games they lost. This resulted in a 43% chance that they are drawn from the same distribution, i.e. it’s a 43% probability that the heat had no effect. This is a fairly ambiguous region of probability space so I wouldn’t shout from the rooftops that European teams are more affected by the heat than those from other continents. There of course a flaw here, France would probably beaten Honduras if all the players had been forced to wear parkas and the game had been played in an enormous sauna run by a particularly psychotic Finn. Hence there are datapoints in this calculation which would have likely turned out as win for the European team no matter what and there are much closer games which one might expect could be effected by the heat. Hence this rather simple analysis could be affected by small number stats (it would be a truly momentous upset if European teams were to lose all games in hot conditions and win all the colder games no matter what the opposition) so it probably isn’t worth drawing too many conclusions from it. Perhaps a more in-depth analysis involving pre-match betting odds/spreads would help to get rid of that effect. 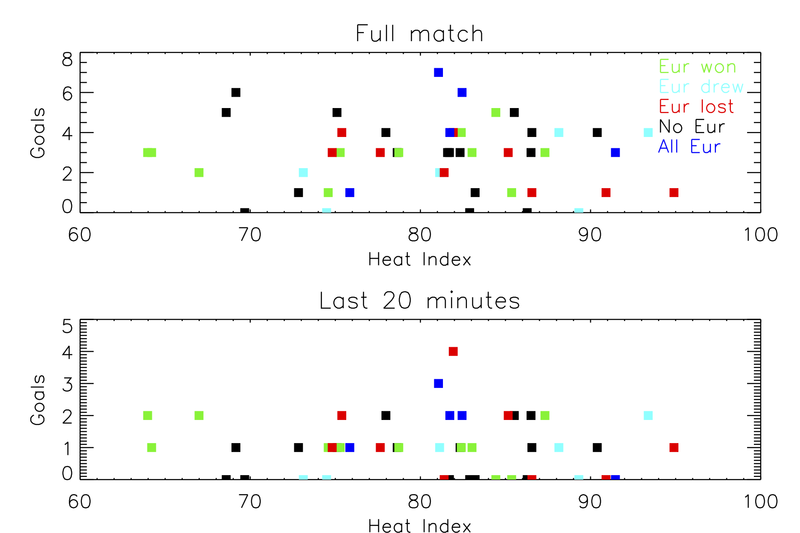 It’s often stated that hot, humid conditions lead to high-scoring matches with European teams underperforming. The results from the group stages do not significantly support these hypotheses. One final note to give this a vague link to astronomy. Astronomical telescopes close in conditions of high humidity to stop condensation forming on the mirrors and electronics. The specific level at which telescopes close varies between observatories. 30 out of the 48 group matches were at a sufficiently high humidity (>60%) that the ESO Very Large Telescopes would not have been able to conduct observations. 25% of games failed the 75% humidity test used by some observatories on Mauna Kea. This is one of the reasons large astronomical telescopes are not situated next to football stadia in Brazil. *Yes, I know, it’s in Fahrenheit, I don’t like it either.